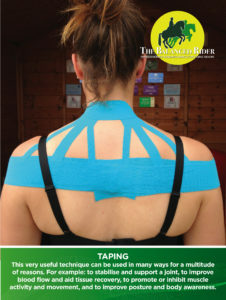 Taping is a very adaptable, effective technique to relieve pain, improve posture and encourage better movement. It is often seen on athletes and sportspeople around the world in multicolours and unusual patterns. At The Balanced Rider we use taping in several complementary ways; to stabilise and support a joint, to improve muscle function, to aide blood flow and healing, and to promote good posture and body awareness. The tape is breathable and flexible, and it will usually survive two or three showers. You can even swim in it.